Home › Edinburgh Festival › Edinburgh : The Photos of my Festivals. Edinburgh : The Photos of my Festivals. As the Edinburgh Festival season starts to wind down I thought I’d reflect on this strange time of year. It’s a time of conflicting emotion, when my desire to cram as much as I possibly can into the last week or so is at odds with my desire to sleep for eleven months until it all comes around again. That’s not just a reflection on my desire to live only in those bright and not so bright summer months when Edinburgh is deluged not just by its usual unpredictable weather but indeed by art and fun and tourists. This is also a reflection on how exhausting it can all be. So rather than a big long wordy post where I try to espouse both my often questioned charm and my love of this time of year, I thought I would keep it simple with photos. I’m often accused of being somewhat simple, so I feel this is an area I should excel in. While taking advantage of many of the fantastic free art instillations around town, I think possibly one of my favourites has been the simply but delightful onslaught of ‘Hello’ flags appearing on the various flagpoles of the city. Strangely though my favourite picture is this one. 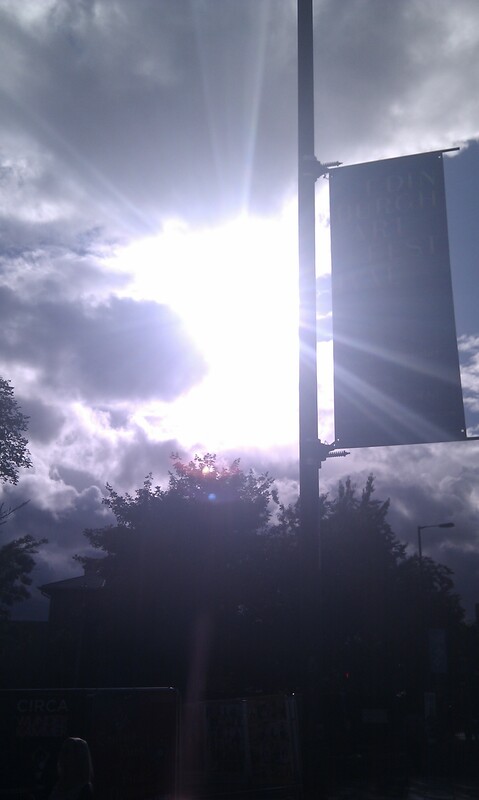 The sun peaking out between an Embra sky to shine behind an Edinburgh Art Festival banner with the posters for various shows hidden in the dark below. Wee dugs ready for action! 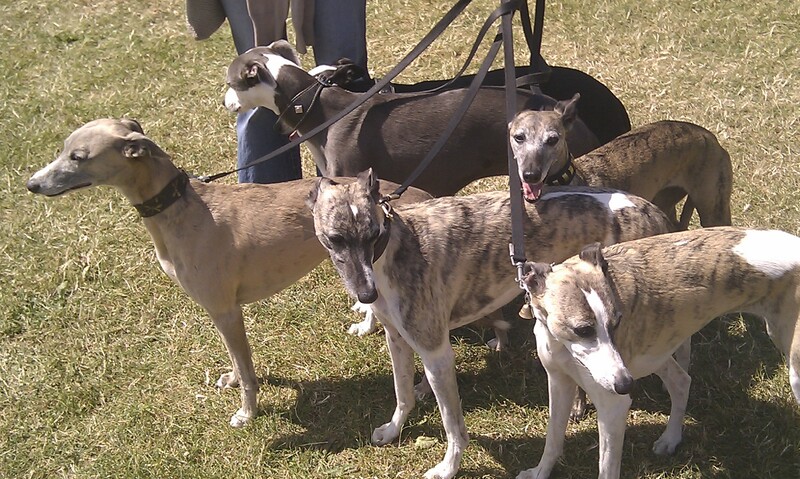 These wee beasts spotted at Holyrood Park. A beautiful day in the sunshine and the Royal Pursuits event at the end of July and start of the big festival period courtesy of the fantastic people at Historic Scotland. Where but Edinburgh would you find a bunch of French guys dressed in tutus, chicken suits and Village People esque costumes dancing around, singing and yelling at a crowd in the middle of town in the middle of the day? Well i guess maybe France , but that’s beside the point! 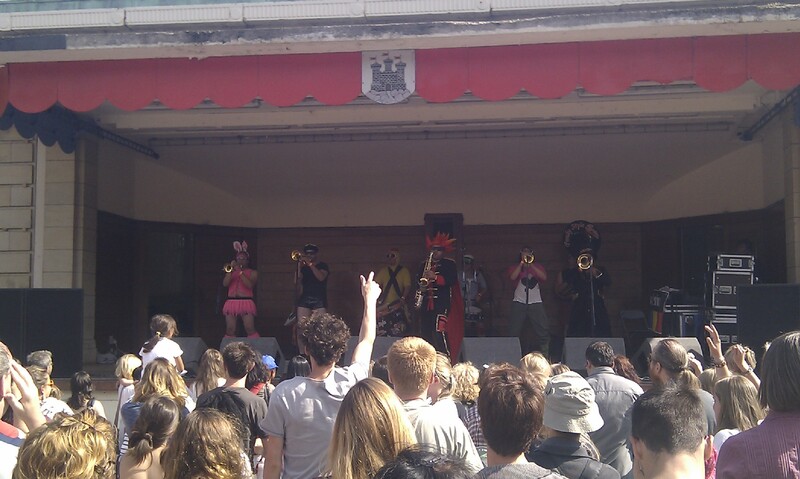 Where but Edinburgh would you see kids, tourists, young folk and pensioners all mixed together and skanking around in the sun shine to the sounds of a brass ska band on a sunny afternoon and all for free? A fantastic slice of the Edinburgh Jazz Festival for everyone to enjoy for free. And yes, it was actually sunny. 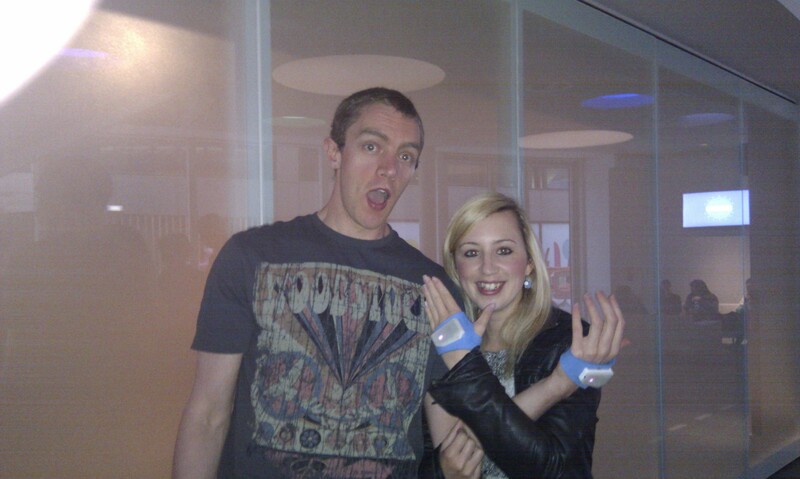 My childlike glee while I waited for ‘lift off’ to take us to New Earth wearing a suitably b-movie sci-fi velcro blue hand thingymajig. Leaving Planet Earth could have been a lot more interactive for my liking but nothing can take away from the little boy who yelled ROCKET SHIP inside my head as the Mercedez coach pulled up in front of the EICC. The Book Festival Monster Who Lives in the Mist! 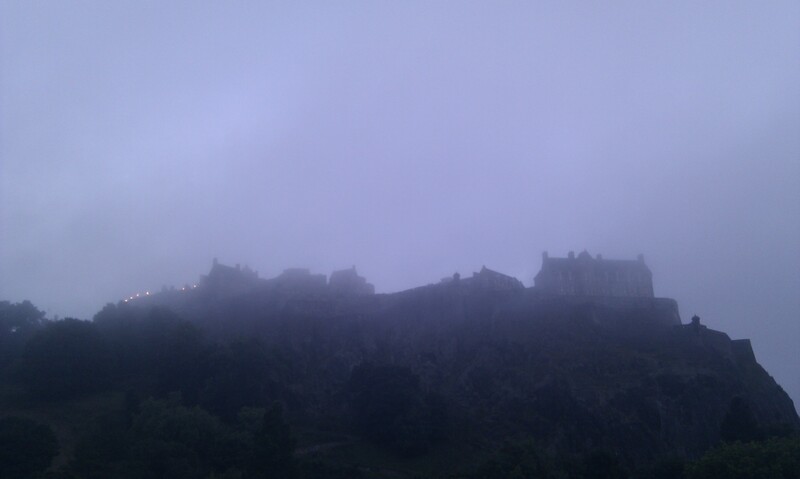 And here the Edinburgh Book Festival monster that lives in the mist. 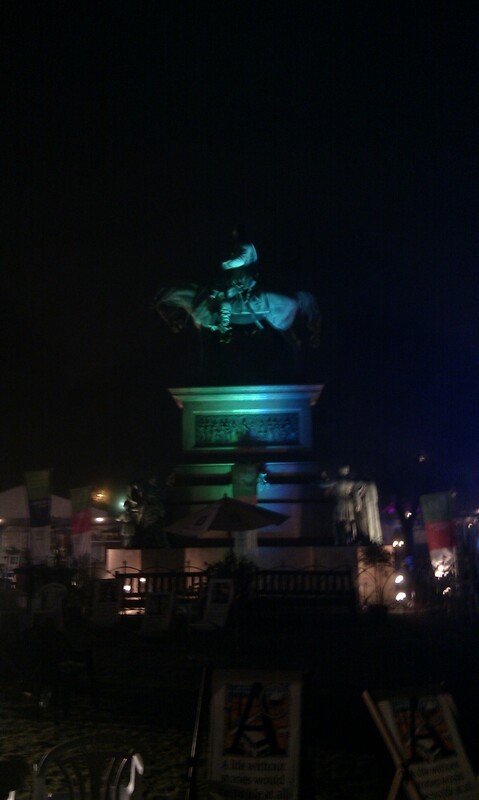 It was weird and wonderful to exit the Guardian Spiegeltent from the Jura Unbound event to see a fog bank rolling over the statue. The eerie lights below lit up the beast in morphing colours as we wandered out into the unfortunately predictable cold of an August night. AND FINALLY : THE EMBRA WE KNOW AND LOVE! Edinburgh. Where mist goes to die. Oh sunshine. I loved you once but you left me. On you, mist, I can rely. And on the festivals too. More reliable even than the sun and the mist together. And more beautiful in how they frame our city too. No time for more writing. I have to dash out and get more festival seen. You should too.